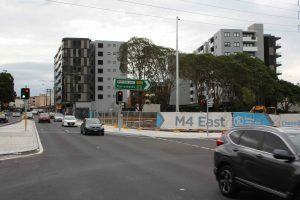 The only WestConnex M4 East or NSW Office of Environment and Heritage ( OEH) Sydney monitor to breach national annual average limits for two measures of particulate matter in 2018 was Powell's Creek in Strathfield near the junction of the M4 and Parramatta Road. PM 10 and PM 2.5 are two sizes of particulates commonly measured in air pollution. PM 10 is the focus of this report. PM 10 refers to particulate matter with an aerodynamic diameter between 10 and 2.5 micrometers. PM 10 and 2.5 are measured in micrograms per cubic metre of air, which is abbreviated as µg/m3. Short and Long term exposure to PM 10 is associated with asthma, lung disease and other respiratory illnesses. 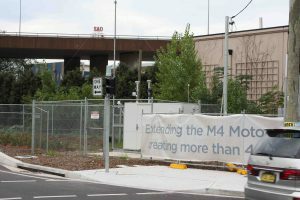 For more about the OEH and WestConnex monitors read this PM 2.5 report. As the chart below shows, Liverpool, which often records the highest PM 10 levels in Sydney was just below the limit. Three of the six WestConnex monitors are in the top four sites for PM 10 in 2018. They are well above NSW's future goal of 20 µg/m3, which has already been adopted by Victoria. Powell's Creek is a very busy location within 500 metres of what will be an unfiltered stack when the M4 East opens later in 2019. Thousands of residents already live and study in this area which is close to Homebush station and to sites where even more high rise apartments have been approved. A failure to put in place development controls near the stacks during construction has allowed this to happen. This is the Powell's Creek monitor at the junction of the M4 and Parramatta Rd. While air quality here can be poor, it may be better or worse in other nearby locations. This monitor is protected by airflows to the NorthWest by the nearby building. Photo Chris Nash. How does St Peter's Public School site compare? In earlier reports, we have covered the alarming levels of pollution at St Peter's. We haven't been able to include St Peters school ( SPPS) in this report because the Sydney Motorway Corporation ( 51% owned by Transurban) has not published any reports since September. In September 2018, SPPS was averaging 29 u/gm3 which was higher than any other WestConnex or OEH monitor in Sydney. It is highly likely that SPPS also breached national limits for PM 10 and PM 2.5 in 2018. However, the monitor at SPPS may not reflect the worst of pollution in St Peters, where residents have been left by WestConnex exposed to 24-hour diesel only metres from their bedrooms for days on end. Wendy Bacon and Luke Bacon will soon be publishing a longer report on pollution at SPPS. Read our report on PM 2.5 in 2018. Wendy Bacon is a journalist and researcher who was previously the Professor of Journalism at UTS. She has been part of the campaign against WestConnex. Henare Degan is an open source specialist and software developer.